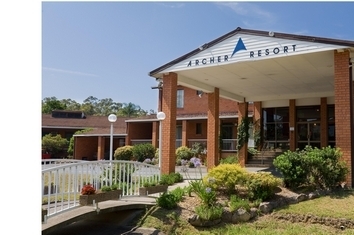 Just two hours south of Sydney,we are situated in the heart of Nowra. 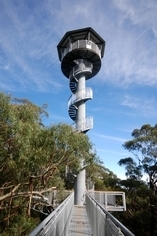 Nowra is within an easy drive of many of the South Coast's wonderful attractions. 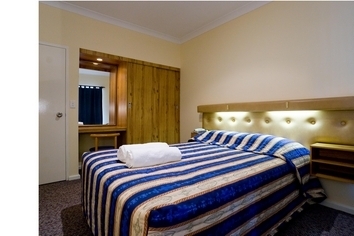 These include Berry, Kangaroo Valley, Jervis Bay and Point Perpendicular and the most beautiful beaches on the South Coast..
We offer a range of rooms, ideal for every taste and budget and a continenal breakfast for two is included in our tariffs. You can upgrade to a fully cooked breakfast of bacon & eggs, etc for a small surcharge. We have Austar available in every room for your enjoyment. It's a friendly, warm, hospitable motel, and our staff will go out of their way to make your stay comfortable and enjoyable. Come and escape with us soon. Spacious family suite with seperate queen bedroom and three single beds in living/dining room. Complimentary continental breakfast is included and served in our Breakfast Room daily. Fully air conditioned with rooms serviced daily, phones ISD and STD, colour TV in each room. Separate shower and bathtub and WC. Small kitchenette and microwave for light meal preparation with tea and coffee making facilities and bar fridge. Access available to Swimming Pool, Tennis Court, Spa and Sauna. Guest Laundry and Wifi Internet facilities available. One room suites with queen size bed and either one or two single beds in each room. Complimentary continental breakfast is included and served daily in our Breakfast Room. Fully air conditioned with rooms serviced daily, colour TV, phones ISD and STD, tea and coffee making facilities and bar fridge. Ensuite with separate WC in all rooms. Access to swiming pool, tennis court, spa and sauna. Guest laundry and Wifi Internet facilities are available. One room suites with queen size bed and either one or two single beds in each room. 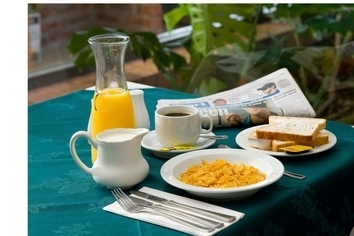 Complimentary continental breakfast is included and served in our Breakfast Room daily. Fully air conditioned with rooms serviced daily, colour TV, phones ISD and STD, tea and coffee making facilities and bar fridge. Ensuite with separate WC in all rooms. Access to swiming pool, tennis court, spa and sauna. Guest laundry and Wifi Internet facilities are available. Two Room Suite with master bedroom and separate living/dining room. Continental breakfast for two included in tariff. Fully air conditioned with rooms serviced daily, phones ISD and STD, colour TV in each room. Separate bathtub and shower and WC. Small kitchenette and microwave for light meal preparation with tea and coffee making facilities and bar fridge. Access available to Swimming Pool, Tennis Court, Spa and Sauna. Guest Laundry facilities and wifi internet available. 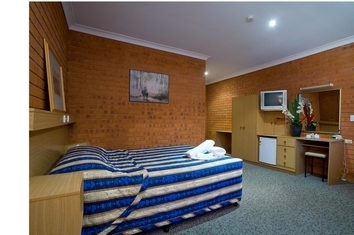 These are budget rooms designed to accommodate tradies or workcrew looking budget accommodation. Rooms are located on the highway side of the Resort and may experience some highway noise. Complimentary continental Breakfast is included and is served from 6 am in the Breakfast Room on weekdays and 7 am Weekends. Hot Breakfast an extra $5.00 per person. 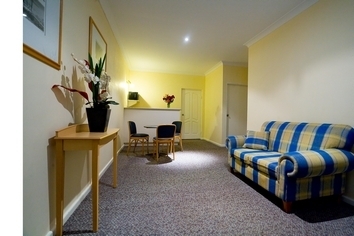 Rooms have tea/coffee making facilities,small fridge, air conditioning, austar and wifi broadband. They have ensuite bathrooms and seperate WC. There is also plenty of off road car, bus and truck parking. Book Now! Dinner/Bed/hot Breakfast & Whale Watching Cruise for 2 Adults & 2 children. Fully air conditioned with rooms serviced daily, colour TV, phones ISD and STD, tea and coffee making facilities and bar fridge. 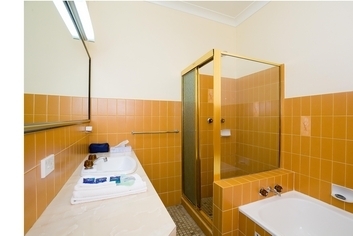 Ensuite with separate WC in all rooms. Access to swiming pool, tennis court, spa and sauna. Guest laundry facilities are available. Wifi Internet available. 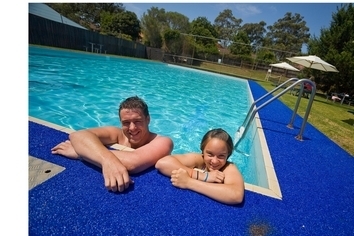 Accommodation & Hot Breakfast Package for 2 Adults in a Poolside Room. Includes a Whale Watching Cruise aboard Tekin III which operates in the unspoilt waters in Jervis Bay. Fully air conditioned with rooms serviced daily, colour TV, phones ISD and STD, tea and coffee making facilities and bar fridge. Ensuite with separate WC in all rooms. Access to swiming pool, tennis court, spa and sauna. Guest laundry facilities are available. Wifi Internet is available. We have photocopying, facsimile and email facilities available at reception. Our tariffs quoted are for 2 persons sharing. We welcome children and extra guests and advise that additional charges apply. Children under 15 are an additional $15.00 per night including a continental breakfast. Infants can stay free of charge and we have cots available. Each room has its own allocated parking area adjacent to your room. We have a large vehicle parking bay suitable for coaches, caravans or large trucks. Travelling South we are at the fifth set of traffic lights after the Shoalhaven River Bridge, just turn left and the entrance is 100 metres down Kalandar Street on your right. If travelling North we are a right hand turn at the first set of traffic lights in Nowra and the entrance is again 100 metres down Kalandar Street on your right. Enjoy a swim in our 20 metre swimming pool or perhaps a spa or sauna would be a relaxing way to spend some time. We have BBQ Facilities available for your use in our pool complex, or visit our Bistro for some fine dining. You will find plenty of things to see and do at the resort. Austar is available in every room for your enjoyment.